370 pages | 107 B/W Illus. Emergency departments have become notorious for long wait times and questionable quality of care. By adopting Lean manufacturing concepts, hospitals can turn the emergency department into a valuable service for the hospital and the community it serves. Leveraging Lean in the Emergency Department: Creating a Cost Effective, Standardized, High Quality, Patient-Focused Operation supplies a functional understanding of Lean emergency department processes and quality improvement techniques. It is ideal for healthcare executives, leaders, process improvement team members, and inquisitive frontline workers who want to implement and leverage Lean. 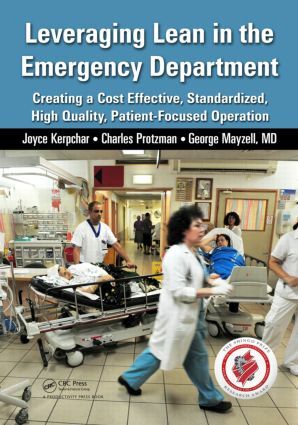 Supplying detailed descriptions of Lean tools and methodologies, the book identifies powerful Lean solutions specific to the needs of the emergency department. The first section provides an overview of Lean concepts, tools, methodologies, and applications. The second section focuses on the application of Lean in the emergency department within the confines of the hospital or clinic. Presenting numerous examples, stories, case studies, and lessons learned, it examines the normal operation of each area in emergency departments and highlights the areas where typical problems occur. Next, the book walks readers through various Lean initiatives and demonstrates how Lean tools and concepts have been used to achieve lasting improvements to processes and quality of care. It also supplies actionable blueprints that readers can duplicate or modify for use in their own institutions. Product Process Flow: "The Patient"